Samuel Roth's grave is at the center of the picture and marked by an American flag. 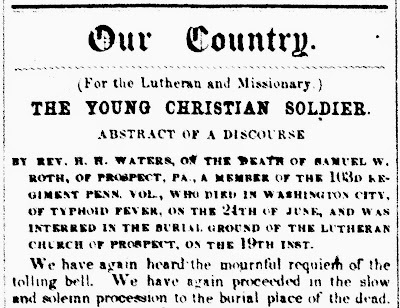 A couple weeks ago, I finally took the opportunity to make a trip north from Pittsburgh to find a Civil War soldier's grave associated with a lengthy eulogy published in the pages of a Lutheran newspaper during the war. The soldier was Corporal Samuel Roth of Company E, 103rd Pennsylvania, who died of disease in May 1862. His pastor, the Rev. Asa H. Waters (bio), of Emmanuel Lutheran Church in Prospect, PA, testified to Roth's Christian character and devotion to the church. The eulogy provides a rare glimpse into church life and mourning during the Civil War era. Waters praises Roth's attendance at prayer meetings, service to the Sabbath School, giving to the missions fund, and his intentions to become a pastor. Using Hebrews 11:4, Waters exhorts his congregation to emulate the example set by the young man. He concludes with a verse from a period hymn by George W. Doanne. Samuel Marion Roth was born on April 24, 1844, to Christian David and Susannah Roth, who were farmers in Franklin Township, Butler County, according to the 1850 and 1860 census. Samuel was baptized at Emmanuel Lutheran Church on June 23, 1844. With real estate valued at $4000 and a personal estate valued at $1169, the family appears to have been relatively prosperous as farmers. Samuel's grandfather, John David Roth, was born on June 13, 1775, in Mount Joy, Lancaster County, and died in 1859 near Prospect. His father was a Prussian clergyman who came to the United States around 1756 as a Moravian missionary to Native Americans. Several of Samuel's first cousins went on to become Lutheran pastors and even presidents of Thiel College. A brother went on to become a pastor. According to a family history, it also appears that two other of Samuel Roth's first cousins, George Washington Roth and John William Strain, died in the war. George W. Roth died at Camp Nolin in Kentucky on December 12, 1861, with Company H, 78th Pennsylvania, and John W. Strain died on January 7, 1863, of "fever" at Falmouth, Virginia, with Company F, 134th Pennsylvania. The Revd. A.H. 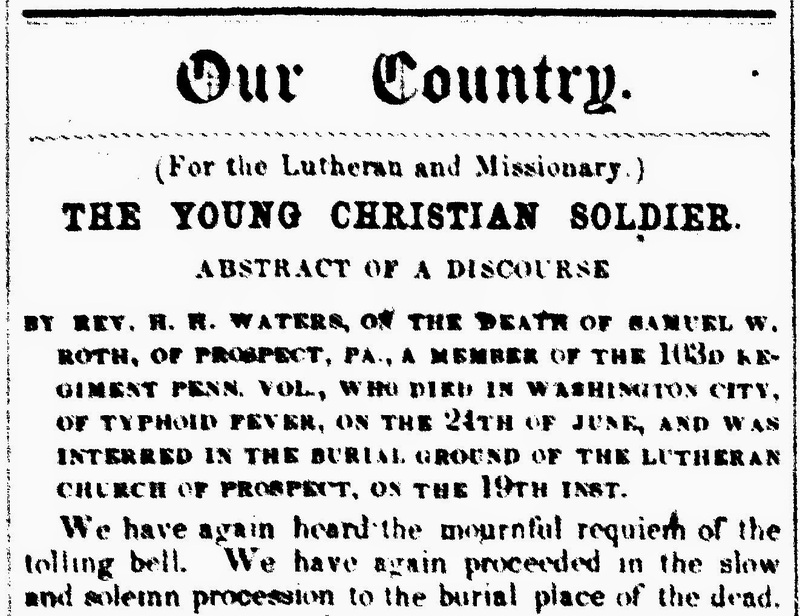 Waters, Pastor of the Lutheran Church in Prospect, deserves and shall be here given, an honorable place among those who upheld the cause of the Union in those dark and dreadful days. He never faltered, he never wavered, but through all stood firm and was a pillar of strength to those about him. He served his country as he served his Church, with true and conscientious devotion. The writer was instructed by him in preparation for his confirmation, examined by him for his first certificate as a teacher in the Soldiers Orphans' Home, at Uniontown in Fayette County, and knew him well for many years and always favorably. The last office he discharged was the mournful one of pall-bearer at his funeral when he was buried in the Allegheny cemetery. He died May 24, 1903. He was active inthe work of recruiting the companies which went out from Prospect, especially in that [Co. F, 137th PA] commanded by Captain Henry Pillow, who was a regular attendant on his preaching and whose family was in his church. Roth was mustered in to Company E, 103rd Pennsylvania, on December 7, 1861. As the Peninsula Campaign unfolded, Roth fell ill and returned to Washington, DC, where he died on May 24, 1862 (there is a typo below stating the date as June 24). The eulogy appeared in the Lutheran and Missionary, the conservative/confessionalist paper associated with Charles Porterfield Krauth and William A. Passavant, who included him in some of his earliest aid work in Pittsburgh in the 1840s. In 1863, Waters went to Memphis, Tennessee, with the US Christian Commission and brought thirteen orphans back to be cared for in homes in Zelienople and Rochester, PA. After the war, he established a Soldiers' Orphan School in Uniontown, which later moved to Jumonville. Waters labored as the school's superintendent for 24 years. As an interesting side note, the superintendent of the statewide orphan school system for much of this time was none other than J. P. Wickersham, who helped recruit Company E, 79th Pennsylvania. We have again heard the mournful requiem of the tolling bell. We have again proceeded in the slow and solemn procession to the burial place of the dead. We have again stood around the open grave, and beheld, with tearful eyes and stricken hearts, the remains of one of our number silently deposited in their last earthly resting-place, and heard the solemn words pronounced, "Earth to earth, ashes to ashes, dust to dust." Our brother who so recently left us, on his patriotic mission, buoyant with health and spirits, whose robust constitution seemed able to endure the toils and exposures of a soldier's life, has returned to us; but, alas, how changed! That noble form, so erect and buoyant with life, how prostrate in death's embrace! Those hands so ready to engage in life's duties, and so willing to serve his bleeding country, how motionless! Those eyes which ever reflected the kindness, gentleness, generosity and purity of his heart, how lifeless! and that heart whose every pulsation throbbed for humanity, for patriotism and for God, how hushed in the sleep of the grave! Who is there among his friends and acquaintances who does not exclaim, with the prophet, in contemplating his character, "Alas! my brother!" Having had our contemplations directed to the great truth contained in the words of the Apostle, spoken of Abel, "He, being dead, yet speaketh," let us inquire how far these words are verified in the case of our departed brother. Truly, for one so young in years, and so recently enlisted in the service of Christ, the declaration of the Apostle may be affirmed in him in no ordinary sense. On the 2d of October, 1859, having just entered upon his sixteenth year, after a due course of catechetical instruction, he became a communicant of the church by the solemn rite of confirmation. Here, around this sacred altar, with a number of others, one of whom has already preceded him to the  land, he professed Christ. How sincere that profession was is seen in his life. "Being dead, he yet speaketh." He speaks to us, and particularly to the young of this church, by his example. 1. In his early profession of faith in Christ. How many, even older than he, think themselves too young to profess Christ! How many think such an early profession incompatible with the character of youth, and destructive of their happiness! How unwise and contrary to the truth! Such were not the views entertained by the deceased. He believed that the morning of life was the time when we should consecrate ourselves to the service of Christ, and so, acting upon this conviction, thus early professed faith in Christ. 2. In the earnestness of his profession. It was not simply a profession, as it is too often the case, "having the form of godliness but destitute of the power." The earnestness of his profession is seen is his punctuality in attending the public worship in God's house. How seldom was his seat vacant in the sanctuary! God's house was to him a sweet and delightful place. In a letter which he wrote from the army near Yorktown, but a short time before his illness, he inquires concerning the welfare of the church, and remarks that he thought of us on our Communion Sabbath, and was with us in spirit, though he could not participate in the blessed feast. He loved the church. He could not forget her. With all the paraphernalia of war around him, and the excitement of the approaching siege, his heart was with his brethren in the church, and, with David, he could say, "If I forget thee, O Jerusalem, let my right hand forget her cunning. If I do not remember thee, let my tongue cleave to the roof of my mouth; if I prefer not Jerusalem above my chief joy." His connexion with the church militant has ended. He is now a member of the church triumphant. 3. In his zeal for the cause of Christ. He not only loved the church, but he also loved the cause of Christ. As an evidence of this he transmits, but shortly before his sickness, out of his hand earnings as a private, the liberal sum of two dollars and fifty cents for the cause of missions, which was dear to his heart. It was his last offering for the cause of his Divine Master. Precious legacy! The reward of weary marches and painful watchings! But he now has a richer reward in the realization of the words of Jesus, "Inasmuch as ye did it unto the least of these my brethren, ye did unto me." Ah! friends, does he not speak to us in this example of benevolence and interest in the cause of Christ! How sparingly and how reluctantly do we often contribute to the cause of the Redeemer! But, another and still better evidence of his zeal for the cause of Christ, is seen in his having consecrated himself to the work of the Christian ministry. This was his full determination, and had he been spared to return, he would immediately have entered upon a course of studies in view of that work. But it has pleased the Lord to make him a ministering angel in the courts of heaven, instead of a minister of the gospel here on earth. Blessed change! We would not call thee back, my brother, from that exalted station, to endure the toils and trials of this earthly ministry. Again, his earnestness in the cause of Christ is seen in his labors in the Sabbath School. How many, both old and young, of professed Christians have no interest in the Sabbath School! It is regarded as something outside of the church, and hence, having no claim upon them. Thus this blessed instrumentality for good is often suffered to languish for the want of aid and encouragement. But, our brother did not thus lightly regard this work. He was faithful in his duties and attendance as a teacher in the Sabbath School. And finally, his zeal is seen in his love for the prayer-meeting. Alas! here we miss our brother the most. How few there are who are found at the prayer-meeting! How fewer still to participate in its exercises! How few consider this amongst the duties of the Christian! But, our dear brother was not long, after publicly professing Christ, in becoming a co-worker in the prayer-meeting. He loved to be there, and those who have attended these meetings can bear testimony to the humble and fervent character of his prayers. That voice we shall no longer hear. O does he not speak to you, my brethren, who have neglected this duty, in most earnest language! But we most close. We have paid but an imperfect tribute to the memory of our departed brother. But no tribute can be greater than that which is given in the words of the text, "He being dead, yet speaketh." Then let him not speak to us in vain. Let his example of early consecration speak to the young. Let his example of zeal for the cause of Christ, of his faithful discharge of Christian duty, speak to us. Who is there amongst the young men in this church to take his place in preparing for the holy office of the ministry? The church now mourns the loss of many in this terrible war, who had devoted themselves to this work. Who will fill their places? Who will takes his place in the Sabbath School? Who, in the prayer-meeting? He speaks to many in this church to come forward and earnestly engage in every Christian duty. In conclusion, we would say to you whom this providence has bereaved, seek comfort in that blessed gospel which he professed, and in the assurance that he has fought a good fight, that he has finished his courses, that he has kept the faith, and now wears a glorious crown of righteousness. Left for him no voice of wailing."